It has been a while since I have been able to partake in true team tactics in a bike race. This past Sunday at the Ladera Ranch Grand Prix, I was able to join the SoCalCycling.com Elite Team in my debut weekend as a Cat 1. After pulling an all-nighter getting my new Cannondale SuperSix EVO dialed in with dedicated Race Director Frank Sarate we were ready to take it to the street team and make some magic happen on two wheels. Having met my new teammates, I was excited to have a team with true depth. With guys capable of holding a solo breakaway, to working a smaller echelon, to those capable of taking a field sprint, we planned on how we could best leverage our numbers of having 7 guys in the race. After getting dialed in with some last minute caffeine gels via our gracious sponsor, Clif Bar, we took to the line where for the next 75 minutes of near 30 mph racing we placed a SoCalCycling.com Elite Team rider in every break. The beauty of transitioning from a solo Cat 1 racer to having a team is not having to chase down every threat by myself. With the likes of Tyler Locke getting into a break along with Tim Woo ripping the legs off the collective peloton it left the rest of us to simply follow any bridging efforts. With six laps to go, Lucas Binder was in a break of three that looked good for a podium spot, only to be caught in the last corner. Coming into the last lap, we were able to slingshot Tyler for 5th and Luke Ollett for 7th overall leaving us hungry to soon be knocking at the door of the top slot. With the depth of talent and strong backing of SoCalCycling.com, I see no reason why we can’t turn those results into a top podium spot. The beauty of racing was being able to place 6 of our 7 boys within the money. 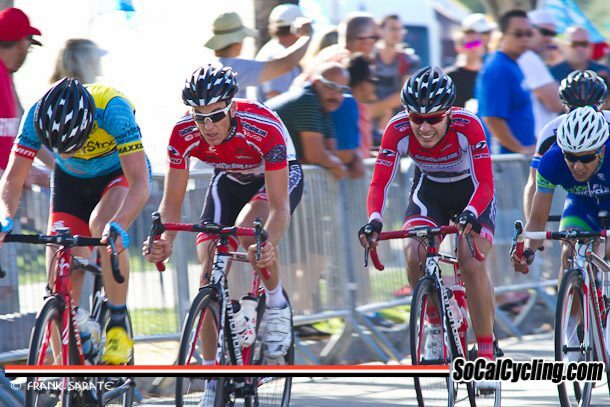 Not a bad breakout weekend for my debut with the SoCalCycling.com Elite Team and I look forward to many more in wrassling with the best bike racers California has to offer. Thrive on friends and keep smashing on those pedals. Thank you to all of our sponsors – SoCalCycling.com – Your Cycling Source, Craig Shelly, Cannondale Bicycles, Sugoi Performance Apparel, FULL SPEED AHEAD, Pacific Premier Bank, ROL Wheels, Clif Bar, fi’zi:k, Echelon Design,Caravan Global, Incycle Bicycles, Continental Tire, ASEA, TRP Brakes, Larsen’s Restaurants, Levi Locke, Michael Klinkenberg.